In a beautiful park, located just ashore the magnificent Geneve Lake sits the 18th century Swisscastle—Chateau de Vidy. In three short months another $453 Million building will stand alongside the historic landmark. For 51 years the Chateau has been “home” to the International Olympic Committee serving as their Headquarters and providing offices to former IOC presidents and employees. 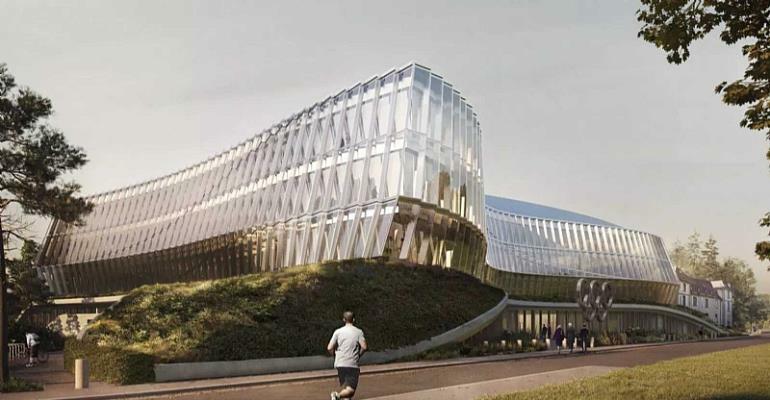 The new building which will replace Chateau as the new IOC Headquarters, will be called Olympic House and hopes to bring 500 plus IOC employees who are currently spread over four locations in Lausanne, together under one roof. Five objectives Marie Sallois, Director of Corporate Development, Brand and Sustainability for Olympic House explained that since the beginning of the project that began in 2012, they have had five key pillars that translate into the Olympic Movement’s principles. Those objectives are movement, transparency, flexibility, sustainability and collaboration. What you’ll see Ammundsen thoroughly described the detail that went into each decision made for the Olympic House structure—all following the five objectives. The symbolism is strong throughout, with an example in the shape of the building itself symbolizing movement that was inspired by a snowboarder. The “movement” in the façade is also a way to emulate the flexibility and agility objective as well. The IOC wanted The Olympic house to represent the graceful movements of an athlete while also functioning as a workplace. Another example of the symbolism in the structure is the iconic Olympic rings that are reshaped, resized and recolored to be made into a staircase. The staircase also fits the objective of “collaboration”, giving employees a space to meet and interact. Transparency is shown throughout Olympic House with a glass façade showcasing views of the lake and bringing in great amounts of daylight. According to the architectural statement, the symbolism of the building’s transparency is meant to represent the openness of the IOC as an organization. Sustainability Likely the most important objective that the IOC focused on was their commitment to sustainability in the design of the Olympic House—targeting three high level sustainability certifications that are recognized both international (the LEED standard) and nationally (the Minergie and SNBS standards). Renewable energy, smart-building features, heat recovery systems, solar panels and using lake water for heating and cooling the building are just some of the ways that the Olympic House will be recognized as sustainable. Moving in Sallois and her team-members who have been collaborating on the Olympic House project will be the guinea-pigs of the new building set to pack-up their things and move at a tentative date of the 6th of May. If all goes smoothly the rest of the 500 employees will follow on May 26 and the inaugural opening is set for June 23, 2019.